Loretta Lynch being sworn in before testifying during her confirmation hearing before the Senate Judiciary Committee Jan. 28, 2015, on Capitol Hill in Washington, D.C.
After 166 days of waiting—longer than the last seven nominees for U.S. attorney general combined—Loretta Lynch is expected to finally receive a confirmation vote by the U.S. Senate this afternoon. If she is confirmed, Lynch, 55, would be the first female African-American attorney general in history, and only the second woman to serve as head of the Department of Justice. President Barack Obama nominated Lynch Nov. 8, 2014. She is currently the U.S. attorney for the Eastern District of New York. 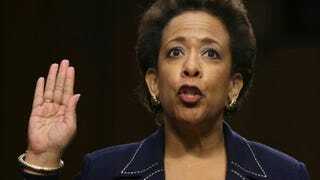 If confirmed, she would be America’s 83rd attorney general. The confirmation vote is expected to be close. There are 51 senators who have publicly stated that they will vote to confirm Lynch. However, the Senate is unpredictable. Seven senators have not declared whether they will vote to confirm Lynch. Vice President Joe Biden is traveling to Illinois this morning but will return to Washington, D.C., this afternoon. In the case of a close or historic vote in the Senate, the vice president usually presides over the Senate and will vote to break a 50-50 tie if necessary.